Of the 200 plus species of primates known, only six families (about 23% of all primates) are nocturnal. The Lorisidae family, consisting of lorises, galagos and pottos, is one of them. 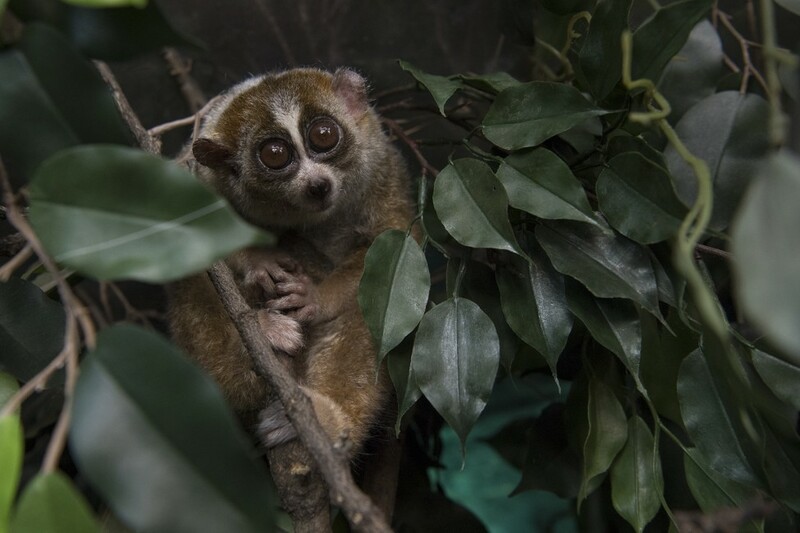 During my career with the Wildlife Conservation Society, I have had the opportunity to work with several species of these primates that prefer the dark including the Bronx Zoo’s pygmy slow lorises (Nycticebus pygmaeus). 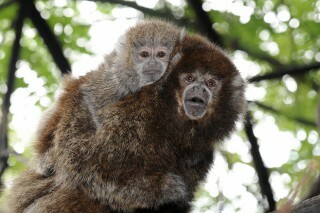 These small Asian primates weigh between one and two pounds. Their arms and legs are nearly the same length with an incredibly strong grip which allows them to move just as easily hand over hand above a branch as below it. They live in trees and, when threatened, can secrete a toxin into their saliva making their bites toxic to predators including humans. Pygmy slow lorises are native to Vietnam, Laos, and the province of Yunnan in China. They have become widely noticed through viral videos on the internet. And while their small size, large, round, forward-facing eyes and furry bodies make them extremely cute, owning one is illegal. Pygmy slow loris are considered Vulnerable by the IUCN Red List of Threatened Species. Their populations are affected by habitat loss, use in traditional medicine, and pet trade. Pygmy slow lorises are incredibly difficult to breed and are therefore rarely seen in zoos. Of the approximately 50 animals in North America, the Bronx Zoo cares for two — a breeding pair named Scarab (above) and Honeybee. To exhibit nocturnal animals, the zoo displays the animals using a reverse light cycle. The animal’s exhibit is in relative darkness during the day while visitors are present and receives light during the hours when the zoo is closed. These cycles follow the normal darkness patterns found throughout the year, changing in length with the seasons. 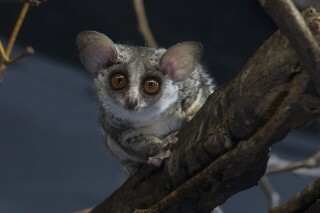 During breeding season, the pygmy slow lorises are kept off exhibit to give them as close to full darkness as possible. The other keepers and I wear special red light head lamps to feed and care for the animals. 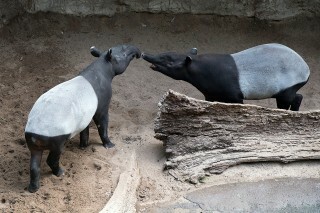 During the rest of the year, visitors can find them in the nocturnal gallery of Bronx Zoo’s Jungle World. EDITOR’S NOTE: Due to their sensitivity to light, we kindly ask visitors to resist taking photographs of the loris and simply enjoy the unique experience of seeing these small primates in person. Our staff photographer was given a special opportunity to photograph the animals during their normal daylight hours. Danielle…wonderful story. I remember seeing the Slow Loris many years ago when the zoo had the exhibit World Of Darkness. I’ll have to check out the Nocturnal Gallery of Jungle World on my next visit.